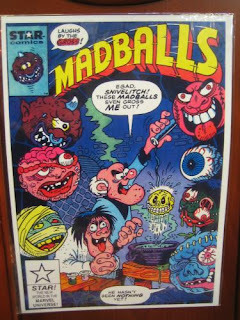 Madballs were a series of collectible toys released in the late 1980s by Amtoy (who also created the Amazing My pet monster teddy bears) who was bought out some time ago by Tyco. 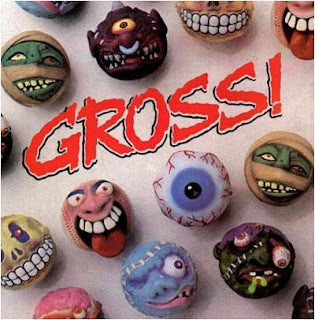 If you like disgusting amputated heads and playing catch loads then this was the product for you. If I remember correctly there was only about 8 in the series consisting of an eyeball, a mummies head, a skull, a cyclops, some weirdo with his eye hanging out and a Frankenstein's monster head. 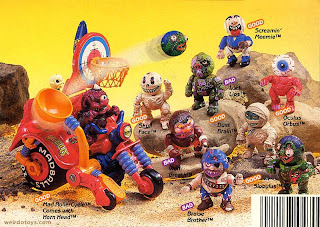 Growing up in the 80's was awesome and products like this made it that little bit more...well awesome. I remember taking one to school and my hippy "lets all go to San Fransisco and smoke crack through Jerry Garcia skull and hug everyone" primary school teacher freaked out when i stuck the eyeball one inside her acoustic guitar and my mother was called in. 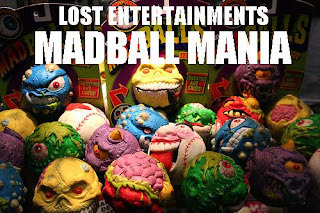 Later on the series really kicked off and a madball styled American football, soccer ball and basketball were released along with a series of action figures who had madballs for heads. These figures had a switch on their back and when pressed the heads would shoot off as if being fired out of a gun! Honestly i think i got my first black eye off of one of them figures...actually I think my first one was when I was six and my teenage sister who listened to new kids on the block through a stiletto across the room which hit me heel first in the eye! I did get a Hasbro Macho Man Randy Savage figure from her in order to silence me but that went out of the window when the arm fell off and replacement wasn't bought!